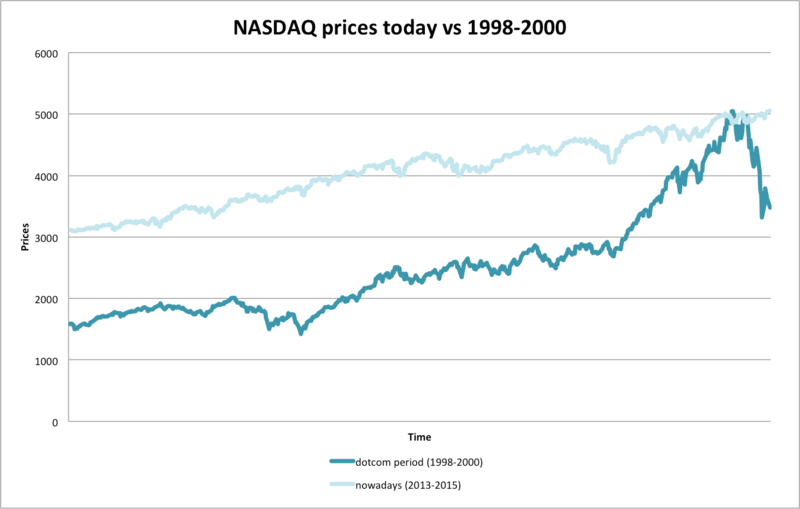 On Thursday 23rd of April 2015, the NASDAQ Composite surpassed the March 2000 dotcom bubble level of 5048.62, closing at 5056.06. On Friday it has then gained furthermore closing at 5092. Looking at the NASDAQ Composite (the market capitalization weighted index includes almost all the companies listed in the NASDAQ exchange) trend of the last few years, no one is indifferent at how today’s prices are similar to the days the dotcom bubble was inflating. Questions are then raised if, this time, the NASDAQ Composite level is justified or not. 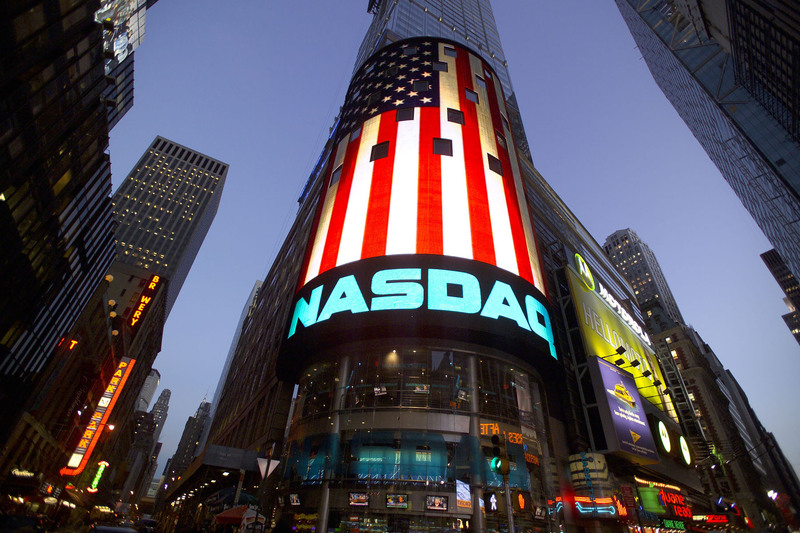 Several companies listed in the NASDAQ exchange released quarterly results on Thursday and Friday. Overall all the big players showed a first quarter revenue about 15% higher year on year and the market priced positively the results. even if the strong appreciation of the dollar dramatically affected certain companies’ performance. So up to a point, the increase in prices of NASDAQ can be justified by the relatively good performance of its participants. However, this does not answer the question whether in absolute terms the prices should be as high as they are now, that is, whether they are driven by fundamentals or not. Analysing the behaviour of the prices today versus the prices during the dotcom crisis it is clear that the prices hike was faster at the end of the 90’s than it has been more recently. Back in the days when Toy Story was a success and tech company prices were rocketing to “The infinity… And beyond”, PE ratios of tech companies were extremely high. In 1999 Cisco, Oracle and Yahoo were showing respectively PE ratios of 127, 103 and 418 well representing the investors evaluation of internet growth potential; today instead Apple, Microsoft and Google show P/E of 20, 16 and 26 respectively. At an aggregate level, the average PE ratio of NASDAQ today is 25, back in the 1999 it was around 170. Nowadays we do not face triple digit PE ratios in the major companies of NASDAQ anymore, which induces us concluding that the situation is clearly different and probably the rise in Nasdaq Composite Index is much healthier than the one in the dotcom period (1998-2000). For sure, in this nominal evaluation we should take into account that high PE ratios are typical of start-ups, and at the time tech companies represented one of the most recent industries evolving, so the nominal difference can be partially explained by this factor. However, we believe that there is a real gap between the level of prices during the dotcom bubble and today’s. As we move to consider the biggest companies in the index such as Apple, Google and Amazon, turns out that the growth of their stock is justified by a real growth of their business. In the previous quarter Apple increased revenue by a healthy 30% with respect to the previous year beating expectations of net sales in each of its products. Moreover Apple’s revenue from Greater China was up 157% YoY accounting now for 21% of the total company’s revenue. 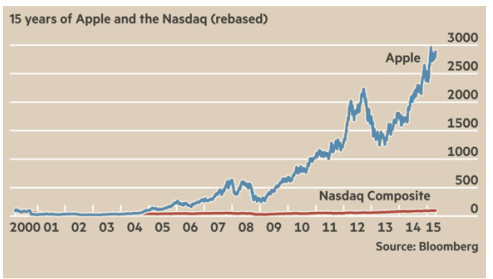 Other major NASDAQ companies also had a huge influence on the Index recovery. 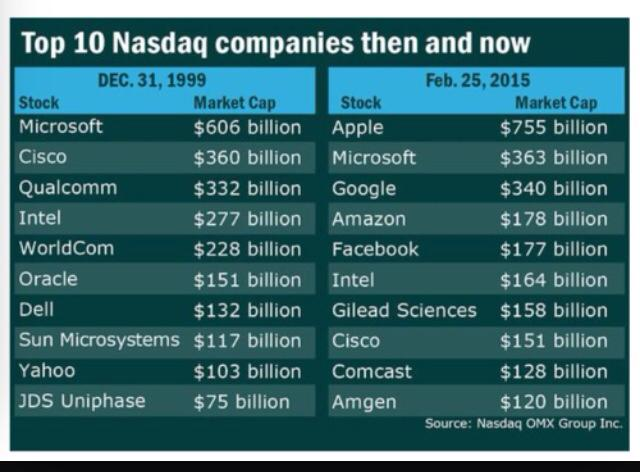 In the period of dotcom bubble Google was not a public company and today is one of the main drivers of NASDAQ index. During the first quarter of 2015 Google revenues of $17,258 are 12% higher than the previous year and if foreign exchange rates had remained constant from the first quarter of 2014 the figure would have been $795 millions higher (thus up 17% with respect to the previous year). Amazon reported an increase in net sales of 15% and an increase in operating oncome of 74% with respect to the previous year. The North American segment showed a 24% YoY growth while the International one appears to be slightly negative (-2%) but excluding the effect of foreign exchange rates the figure jumps to 14%. As the data mentioned suggest, international exchange rates variation have had a big impact on many NASDAQ listed companies that have a large share of sales outside US. Profits are dented as overseas sales are worth less when converted back into dollars, and a permanently stronger dollar can seriously erode the competitiveness of US exporters. Considering all these factors, we believe that NASDAQ full recovery would happen even earlier if the exchange rates had been more stable. Therefore, comparing it also with the S&P 500 trend, NASDAQ level is fully justified under a relative point of view.